As of 2006, more than one in eight people in the United States show signs of addiction to the internet. The recent bear market rally was primarily fueled by market manipulation/speculation (i.e., re-inflating another bubble) and a weaker dollar. This is why the following sectors led the rally and performed well: Energy, Oil, Materials, Metals, Commodities, and lower quality/more speculative securities. The easy money has been made already. Stocks are no longer cheap. The markets as a whole are faced with a future of weak sales and earnings and lackluster returns. 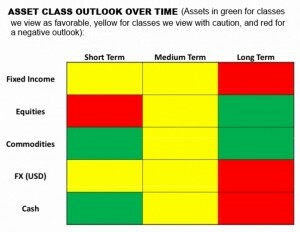 Asset Class Outlook Over Time. At current price levels, the market indices and companies (based on reported sales and earnings) appear to be fairly valued given the near-term economic outlook and consensus. Based on earnings over the past 12 months, the S&P 500 is trading at a P/E of 18.5. This is not far from the 34-year average of 16.8. However, measured on the basis of net, or reported earnings (includes one-time charges) and it’s trading at a trailing multiple of 134. This is eight times the average over the past 73 years. If you smooth out earnings by looking at the long-term P/E, which captures a decade of inflation-adjusted data, then the market is trading at a multiple of 16. This would be equal to the average P/E over the past 130 years, which tells you that stocks are not cheap, but fairly valued. Foreign stocks do not appear to be a bargain either. In Japan, there is no trailing P/E ratio; because the nation’s publicly traded companies are in the red. China’s government is burning through a $586 billion stimulus package trying to keep the economy moving ahead. The Chinese stock market indices have moved up 69% and are trading at 28 times operating earnings. This is somewhat lower than its lofty P/E of 35 over the past 10 years. This is still not a bargain. Swedish stocks are up 23% this year with an earnings multiple of 20, versus a long-term average of 22. Continental Europe is now trading at 15 times operating earnings, versus a long-term average of 16. However, this comes with a weakening economy, slack demand, more fiscal stimulus, and profits that have further to fall. A strong job market and investment-rich climate depend on all of the following factors: 1) a strong and stable dollar, 2) confined and limited federal spending, 3) good legislation, 4) strong contract law, 5) a reduction in taxes, and 6) smart financial regulation. To date, Congress and the Obama Administration continue to ignore all of the above with little to no definitive positive action. The Obama Administration has kept most of the Bush Administration’s flawed policies, and added increased spending and the threat of increased taxes. The U.S. Central Bank and Government cannot continue to print more money and afford another stimulus package without dire consequences. Therefore, the U.S. Central Bank and Government are going to be forced to increase interest rates before year-end 2009 and adopt a credible and stable strong dollar/greenback policy. Credit and other market signs are signaling this change now. With all of the stimulus packages and money the U.S. and World is printing and pumping into the economy; this is inflationary and will bring back the “re-flation” trade/investment. As a result, investments that will outperform include: commodities, energy, oil, metals, materials, natural resources, technology, and more speculative growth companies. With all the money being printed by the U.S. Government, this will cause downward pressure on the dollar against other major currencies. The dollar continues to fall against the Chinese Yuan, Euro, Japanese Yen, and Brazilian Real. If the dollar continues to weaken, the government will have to pay higher interest rates to entice investors to buy U.S. Treasuries. These higher borrowing costs will increase the federal budget deficit. The best play on this trend will be foreign countries with strong economies, strong currencies, and strong GDP growth—such as: emerging market countries, BRIC countries, and natural resource-rich countries. Small and Mid Cap companies outperform all other investments as we come out of a recession and over the near and long term. With new financial regulations like reinstating the “Uptick Rule” and modifying mark-to-market accounting (FASB 157), the banks, financials, insurance companies, and other similar entities will benefit. However, currently no definite progress or results have been made on these two critical problems. Global healthcare will continue to grow due to healthcare changes, the increasing number of people covered, positive job growth in their industry, and increasing demand for healthcare services. Strong U.S. companies that can increase dividends and grow sales and earnings in good times and bad times will outperform. These will be large U.S.-based multinationals. This page took 0.264 seconds to load.